You never know when or where hail will strike, and fortunately, it’s not a frequent occurrence here in the Fort Pierce area (not that we don’t already have enough to worry about with hurricanes and the like!). However, when it does happen, it can be devastating to your home, cars, and other property. You might run outside right after a hail storm and believe that you only have minor hail damage, if any, and brush it off. We recommend not doing that. What might seem like minor damage now can become worse over time and end up even worse months or years from now. 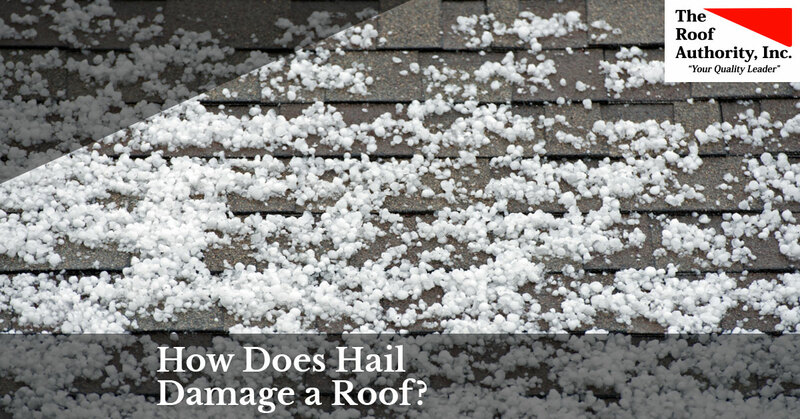 At The Roof Authority in Fort Pierce, Florida, we are your hail damage experts. We’ve been in the business since 1993, and because of that, we’ve got an incredible amount of experience when it comes to hail and hurricane damage. If you’re facing damage after a hail storm, we’ll work with your insurance company and do what we can to assure your peace of mind. Contact us now for a free quote! Here are some of the ways that hail damages a roof. The little pebbles that cover the shingles are there for more than just looks. They protect the felt and the structure of your home from water and the elements. So when they’re removed by hail and even wind, moisture can get through and wreak all sorts of havoc. You don’t want mold and mildew to form, especially—it can work its way through the structure of your home and cause structural damage. Hail can be large enough, and have a fast enough velocity to, puncture your roof. Crazy as it sounds, hail storms can produce this type of violent weather, and even if the stones don’t fully puncture the roof, they can crack the wood underneath. If your home did suffer hail damage, one of the first places you look should be inside your attic to see if you can notice any interior damage. Even if it appears to be only minor hail damage from the inside, it’s best to play it safe and have a hail damage expert come take a look! Just as important as your shingles, your gutters can also sustain severe damage. When your gutters can’t do their job, water can overflow, causing damage to your sidewalks, as well as cracks in your home’s foundation, among other things. Never let a damaged gutter go unchecked—always have an expert tend to them immediately to avoid safety issues down the road. It doesn’t matter if you have minor hail damage or catastrophic hail damage—getting your roof assessed by hail damage experts will prevent further damage down the road that will cost you more money. When you need repairs after a hail storm, look no further than The Roof Authority. Our technicians are on standby, and we offer 24/7 emergency service. Contact us now for your quote and to schedule service!